Ever since the nights have been getting cooler, we’ve started getting into mega soup experimentation mode here at our house. Nothing beats a warm and cozy bowl of soup on a chilly night. We have a really cute market with lots of local foods just down the road from us and every few weeks, we like to pop over there to pick up some fresh meat from the butcher. A new little meat shop recently opened up at the market and my husband surprised me one Saturday with some chicken sausages when I got home from the gym. Sausage isn’t something we have on a regular basis so it was nice to have something new to work with. Now, rather than just cooking the sausage on the grill or in the frying pan, I wanted to be a little more ambitious and actually incorporate it into something. And by something, I mean soup. Because that day, I REALLLLY felt like soup. And if you’re anything like me, once you get that craving for soup, there’s no turning back. You GOTTA have that bowl of soup. I also happened to have some kale to use up in the fridge. One of my favourite ways to use kale that’s about to go bad is to throw it into a sauce or soup. It’s a great way to sneak those greens in there and also softens and flavours it up quite a bit since it tends to be quite tough and bitter on its own. 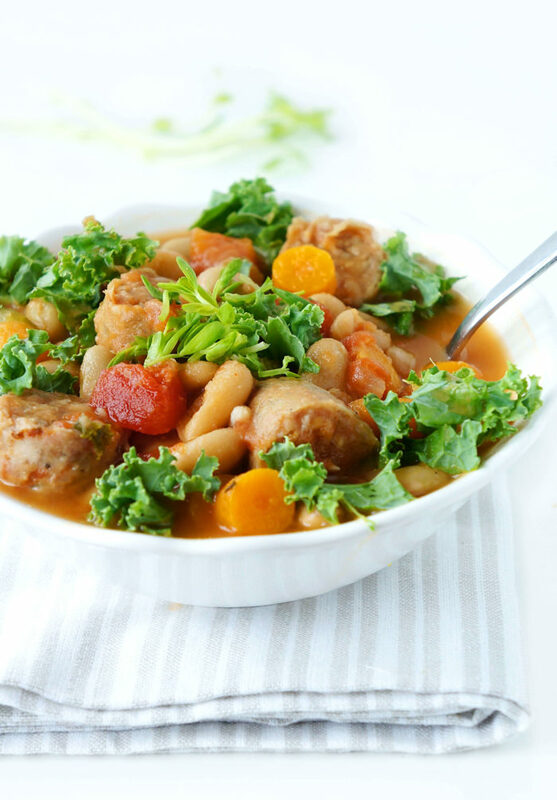 Plus, kale is packed full of vitamin A, K, fibre and potassium, so isn’t that reason enough to add it to our bowl of soup? As I mentioned in my Beef & Quinoa Chili post, we’re in the process of trying to clear out the cupboards before we move…in t-minus 9 days!! It’s amazing what accumulates in those cupboards over the years. One of those items that we seem to have an abundance of are beans. When I was taking inventory, for some reason, we had a TON of cannellini beans. I think I bought them for a recipe that I was going to make a while back (which obviously didn’t happen), so they’ve been in there keeping the black beans and kidney beans company for quite some time. So, into the soup they went. They actually complemented the flavours and colours really nicely and added some extra heartiness to the soup since they’re a great source of fibre and protein. 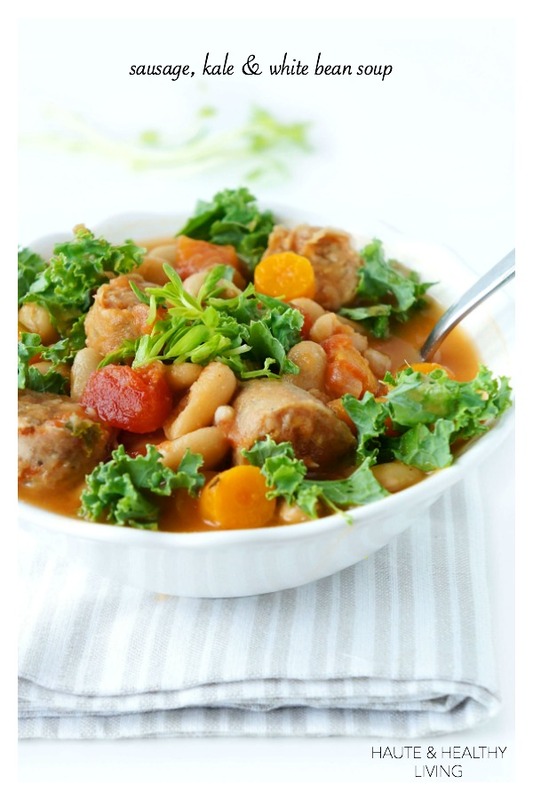 And speaking of fibre of protein, there’s 11 whopping grams of fibre and 22 grams of protein in this soup! That is one filling soup! Although I’m all for trying all different kinds of soup, I prefer the ones that are more hearty so that I’m not ravenous 20 minutes later. No wimpy soups for this girl. On that note, I’m going to go polish off the rest of this soup. In a large saucepan, cook sausage in oil over medium-high heat for 6 minutes or until sausage is browned, stirring occasionally. Remove sausage using a slotted spoon. Add onions, celery, carrots, garlic, and thyme to saucepan. Cook for 8 minutes or until vegetables are tender, stirring occasionally. 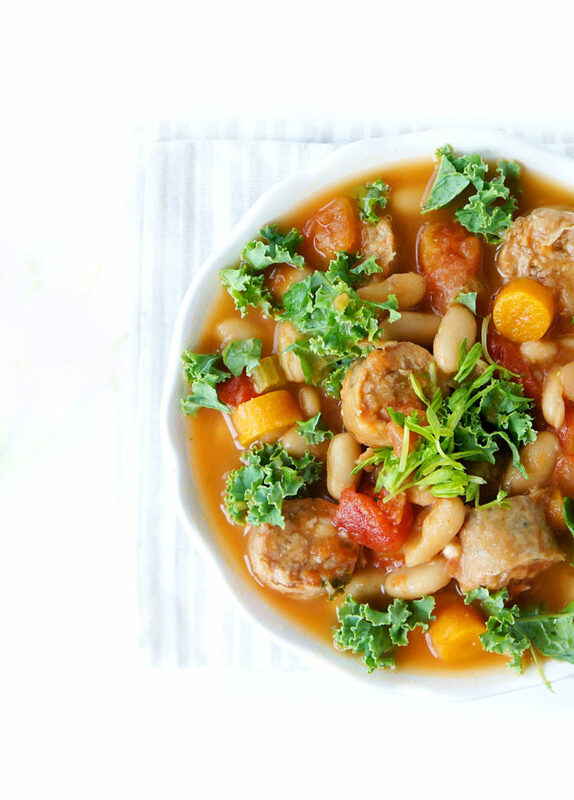 Stir in beans, broth, tomatoes, and sausage, and sriracha and bring to a boil. Reduce heat to low, cover and simmer for 30 minutes, stirring occasionally. Stir in kale and cook for 1-2 minutes until kale is tender. Season with salt and pepper, to taste. * Want to make it vegan? 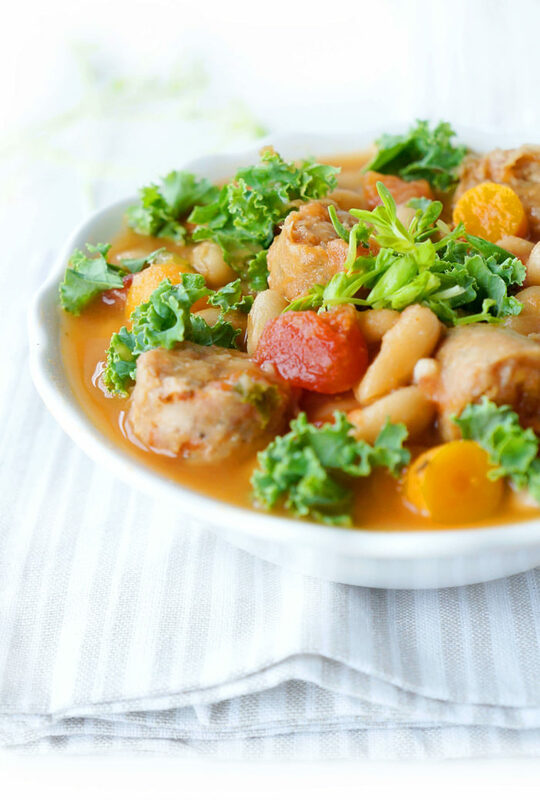 Leave out the sausage and add an extra can of white beans. I’m always looking for healthy entrees, and this one looks absolutely delicious! Thanks for sharing! Thanks so much Emily! Hope you enjoy the recipe if you get a chance to try it out! So glad you joined us!! This soup is amazing – hope to see you next week too! Thanks Helen — I’ll be sure to hop on over next week!